I was enjoyably provoked or nudged today by a blog post from Rob Poynton. Rob writes about how large scale change seems to need systems and programmes that get ‘rolled out’, but which almost always fail, falter or produce unintended consequences. 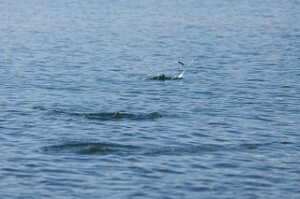 It seems to Rob that changes often happen in unplanned, unintended ways – like a stone skipping across water. The path can’t be planned, and we may not even know where the stone has come from. That’s the kind of change that Rob chooses to be involved in. I intellectually and emotionally agree with Rob’s analysis. It seems right. For example, I think that organisations are best understood as something like conversations – an interactive, creative process that occurs between people, in which we make gestures and offers to each other, which can be received and replied to in unexpected ways that we can’t control. So no one can control what happens in an organisation – they can only make an offer and see how people respond, and in turn respond to those responses. This is very different to a view of organisations that sees them as being like machines. The machine view leads us to try to change organisations by re-engineering them, changing the wiring, drawing up blueprints etc. It is a view that believes that top-down control is not only possible but also the desirable way to bring about change. A small number of people at the ‘top’ of an organisation make some decisions (which might be written up in a document called a strategy), which are then ‘implemented’ or ‘executed’ by more junior people who can be ‘aligned’ so they face the right way. The cleverer and more skilful the people at the top, the more effectively the strategy can be implemented. So here’s the thing. Most of my work is with large, public-sector organisations. And I am often invited in by one or more of those senior people who are trying to do this top-down change thing, and my job is to help them. And their job is to do the strategy-implementation thing – if they fail then they could lose their job. And I do have some sympathy with the people I work with. They want to make things better in particular ways – they want to get their team members working better together with less conflict, they want their organisations to be more productive, they want new types of work to be done to better meet the needs of the people who use their services. They feel they do not have a lot of room to manoeuvre, with pressure from their own bosses, from politicians and from the public to achieve great things in a short time. These intentions to make things better in particular ways are legitimate, it seems to me. And I want to help the managers to achieve them (they are my clients, and my purpose is to help them achieve theirs). And when I start working with these managers I quickly get seduced by the tools of the machine view: I ask to see structure charts and to read the latest strategy, in the belief that they are important. I start to help the manager to develop a step-by-step change plan, with phases and milestones and structural change, because that is what the machine view tells us we need in order to achieve X change by Y date – because how else do you bring about change? I assume that the objectives are given and not negotiable: that we have to achieve X by Y date with Z resources, and that planned change is the only way to do this. What would happen if my client had a conversation with her boss pointing out the flaws in the machine model, arguing that we can’t control change only make offers, and that she can’t guarantee that X will happen by Y date? I imagine that this would not be acceptable, she would be told to get on with it or fired and replaced if she refused. And imagining this conversation also stops me having the same conversation with my client – I imagine that if I explained my view then she would fire me and find someone else who would promise to achieve X by Y. And I do want to work to earn my living. So the machine view has great power. As long as enough of us act as if it’s true, particularly if those with power do so, then it is hard to break out of it (at least, if we want to work it is). And it traps us in a cycle of large-scale, programmed change that doesn’t work (if Rob is right about that). So how to break out of this? I could start by having the conversations I avoid with my clients, instead of avoiding them. The chances are some of them don’t believe the machine view either. (I can imagine some of them saying “I know this won’t work but I’ve got to do it anyway”). And I’d like to work with these managers to find a new and more effective way for them to pursue their legitimate aims within their organisations, which needs a different understanding of their role as leaders and managers, a different understanding of change, and a different view of what organisations actually are. And it needs a different understanding of what my role is in supporting change. I’m not very sure what that ‘different’ understanding is – particularly what someone actually does who wants change to happen but acknowledges they can’t control it. But I am interested in finding out by trying it.